The annual ARRL Straight Key Night (SKN) is not considered a contest; it is “dedicated to celebrating our CW heritage”. For 24 hours beginning on Jan. 1 0000 UTC (New Year’s Eve for those in the US) until 2359 UTC, hams are encouraged to go on air and make enjoyable, conversational CW QSOs. No points are awarded, no fast exchanges, no sequential serial numbers–just get on the air and send CW for the fun and joy of it. The Middle Class Tax Relief and Job Creation Act of 2011 (HR 3630) includes a provision about an amateur radio study to be conducted by the FCC. The Senate passed this bill on Saturday, Dec. 17 with amendments and it previously passed the House on Dec. 13 (vote details). ARRL has said that they long sought after such a study. Thank you to all club members who participated in bringing toys for the Salvation Army. 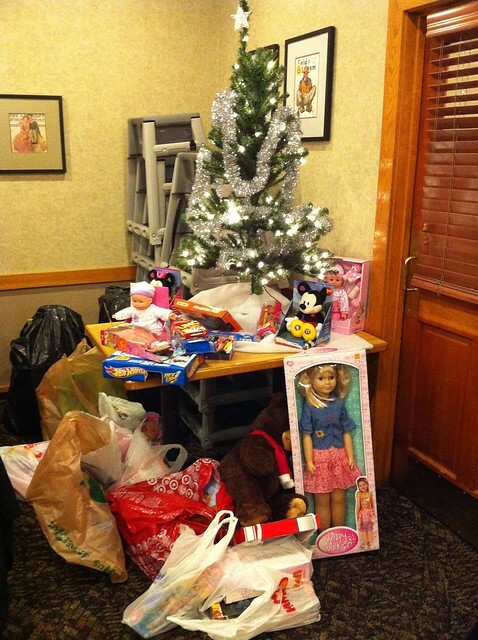 These toys were picked up to be distributed to children who were not chosen from the Angel trees. We all have made a significant contribution. Tony, KF4KFQ will be hosting the 8th annual Santa Net on the 145.23 and associated repeaters. The event will start at 7:00 PM on Christmas Eve. We encourage everyone to check in and let those little hams get on the air to have a QSO with Santa! He is scheduled to transmit from North Pole One! In addition to Tony, one of Santa’s elves, Bruce will be around to assist. The event is also made possible through Tom’s (K1KY) graciousness in allowing the use of his repeater. We encourage everyone to participate and let other hams know. Information should be sent via email to tony.proctor@comcast.net.